Natural Resources Institute Finland started monitoring the salmon spawning runs of this summer into the Rivers Tornionjoki and Simojoki. On River Tornionjoki the echo sounder is located at Kattilakoski Rapids, 100 km upstream from the Baltic Sea near the polar circle. On River Simojoki the sonar is placed near the centre of Simo municipality. In 2014 a total of 100,000 salmon were observed to pass the counting site of Kattilankoski Rapids. This number exceeds all the observations in any other Atlantic salmon river in last twenty years. The natural Baltic salmon stocks are getting stronger. 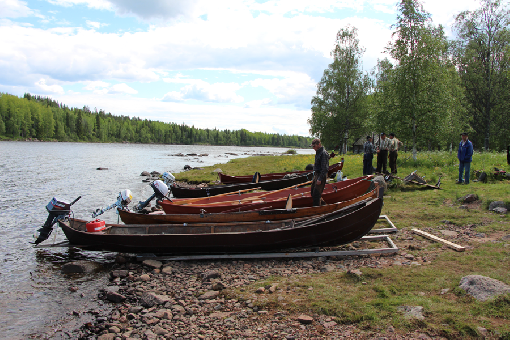 On River Simojoki 4,000 salmon were counted to pass the echo sounder last year. That is four times more than some years before. The peak salmon run normally take place on the counting sites in the end of June. The biggest salmon will arrive to river already in early summer.